Welcome to Sterling Creations Private Limited, Exporter and Wholesaler of Automatic Filing Machines. The company was incepted in the year 1979. We are well equipped with CAD CAM facility and effective after sale services. Technologically advanced infrastructure, safe packaging and customized products make us the first choice of our clients. 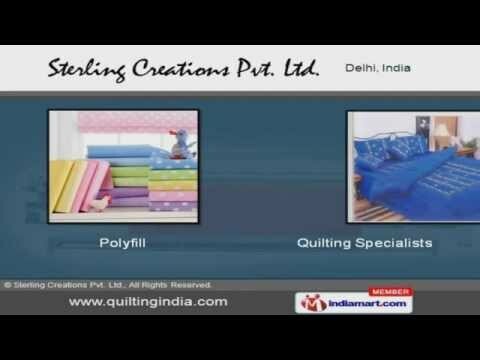 We offer a diverse range of Polyfill, Quilting Specialists and Home furnishing Products. Our Polyfill and Quilting Specialists are widely appreciated in the market. Computerized Multi-Needle Quilting Machines are well known for their outstanding performance. Computerized Single Needle Quilting Machines are setting a benchmark in the market. Our Non Woven Machineries are highly efficient. Along with that we offer Mattress Making Machines that are acknowledged for their functionality.